The treaty followed the fall of Ras Al Khaimah, Rams and Dhayah to a punitive British expedition mounted from Bombay in 1819, principally targeting the fleet of the troublesome Al Qasimi, a seafaring tribe who had committed 'piracy and plunder' according to the British. Ras Al Khaimah fell to the force on 9 December 1819, with Dhayah falling on 22 December. 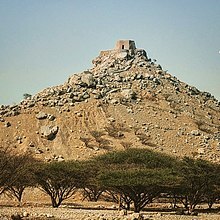 The British expeditionary force then blew up the town of Ras Al Khaimah and established a garrison there of 800 sepoys and artillery, before visiting Jazirat Al Hamra, which was found to be deserted. They went on to destroy the fortifications and larger vessels of Umm Al Qawain, Ajman, Fasht, Sharjah, Abu Hail, and Dubai. Ten vessels that had taken shelter in Bahrain were also destroyed. The Royal Navy suffered no casualties during the action. Under the auspices of the UK's representative Sir William Grant-Keir, the treaty prohibited piracy in the Persian Gulf, banned slavery and required all usable ships to be registered with British forces by flying distinctive red and white flags which exist today as the flags of the respective emirates. The treaty was part of the UK's strategic policy of ensuring an open lines of communication between the British Raj and the United Kingdom, by excluding rival European powers from the Persian Gulf region, notably the Russian empire and France. Britain also sought to pacify the Persian Gulf by preserving the independence of Qajar Iran, the Ottoman empire and the Second Saudi State. Many of the Sheikhs signatory to the 1820 treaty had made prior agreements with the British. The Ruler of Ras Al Khaimah ceded the town itself and the area of Maharah to the British for use as a garrison, and most other coastal Sheikhs ceded boats and armaments in return for an undertaking that the British would not enter or lay waste their towns. Ajman, Umm Al Qawain and Sharjah all came under one preliminary agreement signed with Sheikh Sultan bin Saqr, while others were undertaken with the Rulers of Dubai, Abu Dhabi, and Khatt and Falayah. Like the 1820 treaty itself, this last preliminary agreement was signed by Hassan bin Rahma Al Qasimi, formerly Sheikh of Ras Al Khaimah. The first article of the treaty asserts: "There shall be a cessation of plunder and piracy by land and sea on the part of the Arabs, who are parties to this contract, for ever." It then goes on to define piracy as being any attack that is not an action of "acknowledged war". The "pacificated Arabs" agree, on land and sea, to carry a flag being a red rectangle contained within a white border of equal width to the contained rectangle, "with or without letters on it, at their option". This flag was to be a symbol of peace with the British government and each other. The vessels of the "friendly Arabs" were to carry a paper (register), signed by their chief and detailing the vessel. They should also carry a documented port clearance, which would name the "Nacodah" (today generally spelled nakhuda), crew and number of armed men on board as well as the port of origin and destination. They would produce these on request to any British or other vessel which requested them. The treaty also makes provision for the exchange of envoys, for the "friendly Arabs" to act in concert against outside forces and to desist from putting people to death after they have given up their arms or to carry them off as slaves. The treaty prohibits slaving "from the coasts of Africa or elsewhere" or the carrying of slaves in their vessels. The "friendly Arabs", flying the agreed flag, would be free to enter, leave and trade with British ports and "if any should attack them, the British Government will take notice of it." The treaty was issued in triplicate and signed at mid-day on 8 January 1820 in Ras Al Khaimah by Major-General Grant Keir together with Hassan bin Rahma, Sheikh of 'Hatt and Falna' ('Hatt' being the modern day village of Khatt and 'Falna' being the modern day suburb of Ras Al Khaimah, Fahlain near the location of Al Falayah Fort) and Rajib bin Ahmed Al-Zaabi, Sheikh of 'Jourat al Kamra' (Jazirah Al Hamra). A translation was prepared by Captain JP Thompson. The treaty was subsequently signed in Sharjah by Saeed bin Saif of Dubai (on behalf of Mohammed bin Haza bin Zaal, the Sheikh of Dubai was in his minority) on 28 January 1820 and then in Sharjah again by Sultan bin Suggur, Sheikh of Sharjah and Ras Al Khaimah (at Falayah Fort) on 4 February 1820. On 15 March 1820 Rashid bin Humaid, Sheikh of Ajman and Abdullah bin Rashid, Sheikh of Umm Al Qawain both signed at Falayah. As seen above, the treaty bears some quaint spellings of the names of the signatories ('Abdoola bin Rashid'), the dates ('the month of Rubee-oos-Sanee') and the territories ('Aboo Dhebbee', Shargah, Ejman and Umm ool Keiweyn'). Nevertheless, it was to lead to the recognition by the British of the Trucial States and to a series of further treaties formalising the British Protectorate over the UAE and eventually to the process leading to the formation of the modern United Arab Emirates on 2 December 1971. The treaty having been signed by Grant and all of the Trucial Rulers, the Government in Bombay made clear that while it was happy with Grant's management of the military expedition, it was most dissatisfied with his leniency over the coastal tribes and desired, 'if it were not too late, to introduce some conditions of greater stringency'. The release of Husain bin Ali, the Wahhabi leader and chief of Rams and Dhayah, was particularly regretted. In Bombay's opinion, the treaty should have forbade the building of coastal fortifications, restricted ship-building and stipulated powers of search and confiscation as well as empowering British forces to destroy any construction undertaken in the face of the prohibition. Grant's response was spirited, pointing out that to have enforced extreme measures would have meant pursuing the chiefs into the interior rather than accepting their voluntary submission. This would have contravened Grant's instructions. In the end, Bombay allowed the treaty to stand. The treaty, or perhaps more accurately the memory of the punitive actions that had preceded its signing, virtually eliminated piracy on the coast as a profession and, although there were occasional incidents, the level of maritime conflict - particularly against foreign vessels - dropped dramatically. The Government in Bombay continued to press for more stringent measures against the coastal Sheikhs, including an incident in 1823 when a tower erected in Ras Al Khaimah was forcibly demolished. With the garrison in Ras Al Khaimah withdrawing to Qishm and then giving way to a policy of maritime patrol and the establishment of a native Political Agent in Sharjah in 1823, British actions were reduced to occasional visits to enforce the rule of law along the coast . A brief resurgence in excursions from the boats of the newly established community in Dubai in 1834 was quelled by a demonstration of British naval power in 1835. Meanwhile, the town of Ras Al Khaimah, devastated in the 1819 campaign, did not start to re-emerge with new buildings until 1828. Signed in 1892, the 'Exclusive Agreement' bound the Rulers not to enter into 'any agreement or correspondence with any Power other than the British Government' and that without British assent, they would not 'consent to the residence within my territory of the agent of any other government' and that they would not 'cede, sell, mortgage or otherwise give for occupation any part of my territory, save to the British Government. The agreement came at a time when commercial interest was being shown in the Trucial States by other nations, including Germany, Turkey and France. Immediately prior to the signing of the agreement, a representative of the Persian Government had attempted to establish a Persian claim to the territory, obviating any British interest. The 1892 agreement brought the adventure to an early conclusion. ^ United service magazine Part 1, pp. 711–15. ^ a b Commins, David (2012). The Gulf States: A Modern History. I.B.Tauris. pp. 74, 78. ISBN 9781848852785. ^ 1941-, Heard-Bey, Frauke, (2005). From Trucial States to United Arab Emirates : a society in transition. London: Motivate. pp. 336–367. ISBN 1860631673. OCLC 64689681. ^ Lorimer, John (1915). Gazetteer of the Persian Gulf. British Government, Bombay. pp. 678–680. ^ Lorimer, John (1915). Gazetteer of the Persian Gulf. British Government, Bombay. p. 684. ^ Lorimer, John (1915). Gazetteer of the Persian Gulf. British Government, Bombay. p. 691. ^ Lorimer, John (1915). Gazetteer of the Persian Gulf. British Government, Bombay. pp. 737–738.